At the request of our readers, we provide select “Deals of the Week”. Today we have something special — a bunch of exceptional “Cyber Monday” Deals as well as carry-over Black Friday Bargains. Here are some of the best deals on firearms, hardware, reloading components, and shooting accessories we found. You’ll need to act quickly because many of these deals expire at 11:59 PM tonight (11/28/2016) or on Tuesday. Be aware that sale prices are subject to change, and once clearance inventory is sold, it’s gone for good. You snooze you lose. Brownells has gone “whole hog” for Cyber Monday this year. Visit Brownells’ Cyber Monday Page and you’ll find deep discounts on firearms, optics, mags, reloading tools, ammo, gun parts and accessories. It’s easy to navigate — as there are big topical buttons for all the key product line. 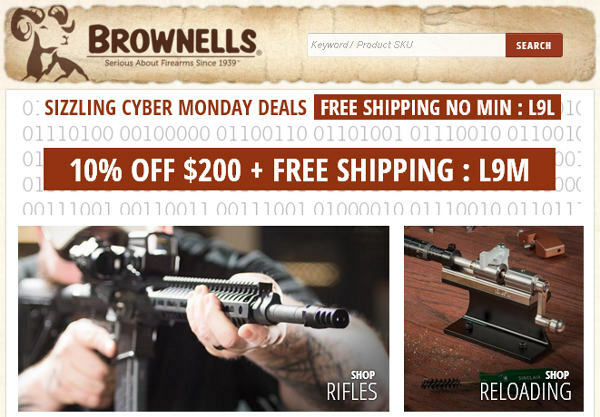 To further motivate Cyber Monday shoppers, Brownells is offering FREE Shipping with Code L9L. And, if you spend $200.00 or more, you can get FREE shipping plus 10% OFF your order with Code L9M. To see all Brownells Cyber Monday deals, CLICK HERE. CDNN is running a Cyber Monday Sale with deep discounts on numerous rifles and pistols. You’ll find great deals on Colt, Remington, and Ruger rifles. But what really caught our attention were the BROWNING BARGAINS. Check out the prices on these smooth-cycling A-Bolt III rifles (as low at $449.00 net after Browning Rebate). And what’s even better, CDNN includes a 3-9x40mm Thompson Center Scope and rings with each A-Bolt III. NOTE: Sale ends Tuesday November 29, 2016 at Noon CST. If you want one of these rifles — don’t delay! 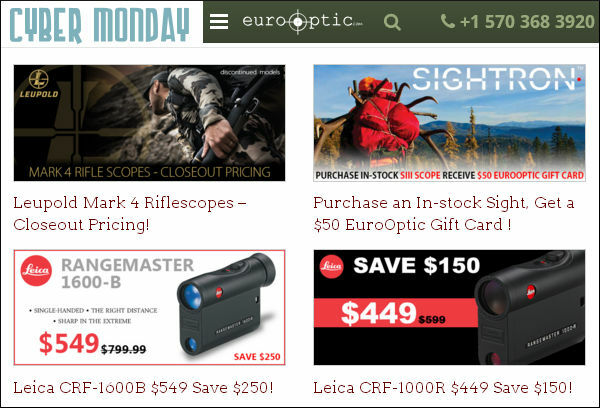 Our friends at EuroOptic.com have rolled out some exceptional deals for Cyber Monday. Buy a Sightron Scope and get a $50.00 Gift Card. You’ll also find great deals on Leica CRF-1600B and CRF-1000R Laser Rangefinders. Last but not least, prices have been slashed on Leupold’s highly-respected Mark IV scopes. With EuroOptic’s Close-Out Pricing, save $200-$300 on these Mark IVs. The Hornady Lock-N-Load Classic Reloading Kit comes with everything you need to turn out high-quality handloads. The Kit includes: Hornady Lock-N-Load Classic single-stage press, Hornady Powder Measure, Digital Scale, Two-Volume Hornady Reloading Manual, Three Lock-N-Load Die Bushings, Reloading Block, Chamfer/Debur Tool, Hand Priming Tool, and One Shot™ Case Lube. We’ve used this press and it is excellent. The L-N-L bushings allow fast die changes. 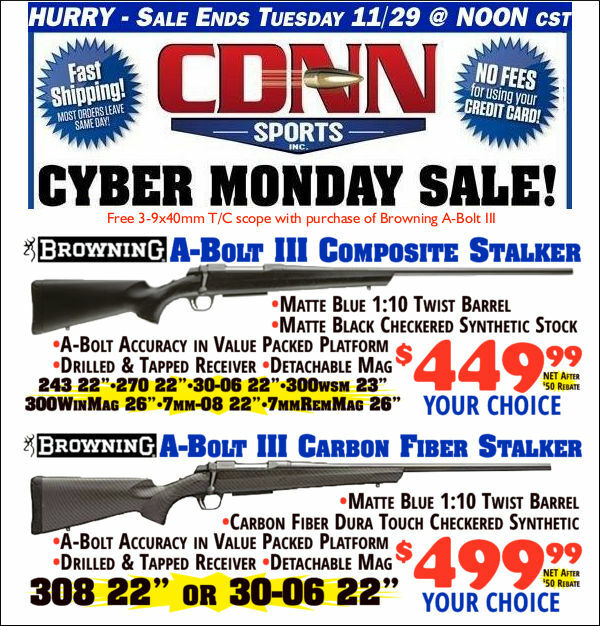 Creedmoor Sports has many items on sale this Cyber Monday. You’ll find discounts on Creedmoor-brand ammo, shooting mats, shooting gloves, and books. But the deal that really caught our attention was the Shooting Coat Special. 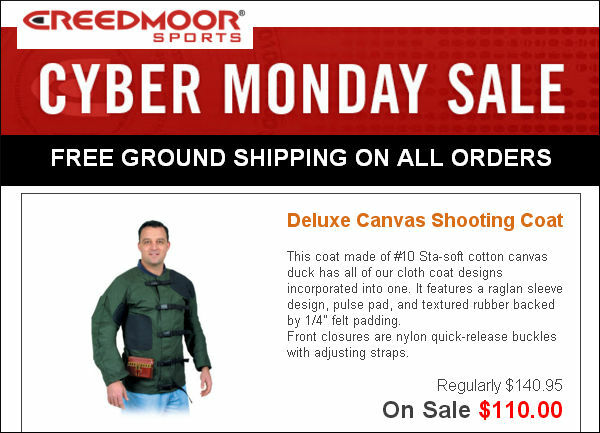 Today you can save $30.95 on Creedmoor’s famous Canvas Shooting Coat. Regularly $140.95, this coat is now just $110.00 — that’s a 22% markdown. Plus on Cyber Monday you can get FREE Ground Shipping on ALL in-stock items in the Creedmoor online store. This special expires at 11:59 pm, November 28, 2016. 1. SIG Sauer® KILO 2000™ Rangefinder, $349.99 (regularly $499.99). 2. Remington® 700™ ADL Bolt-Action Rifle and Scope Combos, $409.99 (regularly $459.99). 3. Frankford Arsenal® Platinum Series Rotary Tumbler, $129.99 (regularly $184.99). 4. Kershaw 3/4-ton Knife (2.75″ blade), $9.99 (reg. $29.99). Editor: Great buy at $9.99! I bought two. Gander Mountain carries a large selection of outdoor gear, reloading products, and hunting accessories. This national retailer also sells pistols, shotguns, and rifles. If you find an item of interest at GanderMountain.com, save cash with Coupon Code CYBER2016. This saves $20 on $100+ orders, saves $50 on $250+ orders, and saves a whopping $100 on $500+ orders. NOTE: This promotion expires November 28, 2016 at 11:59 pm EST. 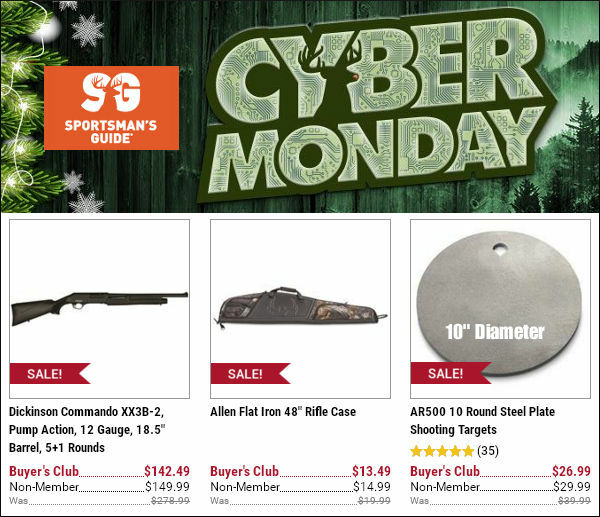 For Cyber Monday, Sportsman’s Guide has slashed prices on 140+ items. Hunters will find a wide selection of footwear and camo hunting apparel on sale. In addition, there are bargains on hunting accessories such as game cameras, gloves, and winter wear. Shown above are some very good deals we found on the Cyber Monday Sale Page. Share the post "Bargain Finder 63: Cyber Monday 2016 Special Edition"